Despite being 46 kg heavier, the 570S is just as potent as the coupe. McLaren Automotive has a lot of cause for celebration right now. At this week’s Goodwood Festival of Speed, the British automaker reiterated its record sales of 3,286 cars worldwide last year representing a 99 percent increase over 2015, and is on track to sell over 4,000 cars this year. A lot of its success can be attributed to the Sports Series, so the recently-revealed 570S Spider should help the automaker achieve that target. The dashing droptop coupe just made its global debut at Goodwood allowing us to gaze at it in the metal for the first time. Remarkably, the 570S Spider is just as potent as its hardtop sibling, capable of reaching 0–62 mph in 3.2 seconds and a top speed of 204 mph – despite the roof mechanisms adding an extra 46 kg of weight. Powering McLaren’s first ever convertible in its Sports Series range of cars is a 3.8-liter twin-turbo V8 that sends 562 hp and 443 lb-ft of torque to the rear wheels. 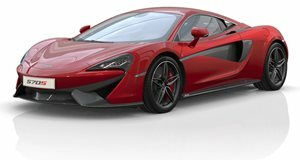 At speeds of up to 25 mph, the roof, which uses mechanisms borrowed from the 650S and 675LT Super Series models, can be retracted or closed in just 15 seconds. McLaren says there’s no loss in torsional rigidity or strength with the roof down thanks to the MonoCell II carbon-fiber chassis. Set to go on sale in September, the 570S Spider will set you back $208,000. If that doesn’t take your fancy, McLaren is also showing off the new 720S Super Series at Goodwood alongside a full-sized Lego model made up of 280,000 bricks.